Here’s an answer: Have something relevant to say, that’s of interest to who you’re trying to reach, and then simply ask. True Potential author Darlene Nixon is the Executive Director of Habitat for Humanity in Hart County Georgia. Her novel, The Condition of Living: Building, Binding, Healing The Habitat Way is built around the setting of a local Habitat for Humanity home building project and its message is focused on the positive impact Habitat for Humanity has in the lives of individuals and communities. It was only right that Darlene share her story with Former President Jimmy and First Lady Rosalynn Carter, also Georgia residents, and also deeply committed to Habitat for Humanity. But really, how do you share your book with a former President and First Lady of the United States? Simple (at least it was for Darlene). She asked. Darlene sent a note via e-mail to the Carter Center. I am Executive Director of the Habitat for Humanity affiliate in Hart county Georgia, and an author. I would like to send President Carter a copy of my recently published novel; The Condition of Living: Building, Binding, Healing the Habitat Way. It is a fictional, Christian story about the personal impact of Habitat for Humanity. Please advise as to the proper way to submit to him. Thank you. She copied me on the note. As her publisher (and to be honest, inspired by her action) I immediately followed up with another note to the Carter Center. I received a copy of this note from Darlene Nixon regarding her new book The Condition of Living: Building, Binding, Healing the Habitat Way and wishing to forward a copy to President Carter. As Darlene’s publisher, I would strongly encourage you to consider her request. The book is delightful and uplifting and the story serves as a framework to share the mission and heart of Habitat for Humanity. It should be considered reading by every leader in the organization. 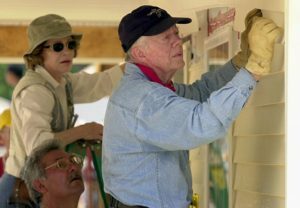 I believe that President and Mrs. Carter, as Christians and profound members of the HfH family would find the story inspiring and worth their attention. Thank you for your consideration and help in fulfilling Darlene’s request. I received another note from Darlene this week. The Carter Center called her and welcomed her gift of The Condition of Living to the Carters. 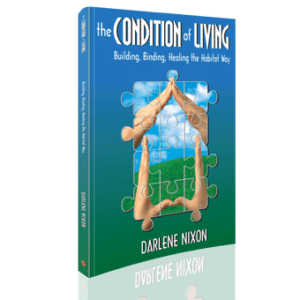 Darlene – Thank you for the message of hope and healing wrapped in your book, The Condition of Living, and congratulations on reaching your audience with your message. Moral: Your message has its own audience. It could be an audience of hundreds, or thousands, or even millions, but even an audience of millions is made up of individuals. Your audience may be a homeless mom looking for answers to life and simple shelter for her kids. Your audience may be a businessman, all success on the outside and a life that’s crumbling on the inside. Your audience may even be a former President and First Lady of the United States. Your job as an author is to simply share your message with its intended audience, whoever and wherever they may be. You may be surprised who you reach! How about you? Do you have a book in you? Are you working on your manuscript? Is it finished? Is 2017 your year for a success story?